I’m wondering if there is such a thing as “national clean out your closet week” — if there isn’t my next question is how do I go about starting one???? I’ve been working for a couple of months on cleaning out all my closets —- not the “junk” closets, just the ones that I have clothing in. ** Dig all the way to the back of the closet and get out those clothes you haven’t worn for years! Check them out closely. ** If you’re like me and have gained and lost a lot of pounds over the years, some of those clothes that were hidden away fit perfectly now, and some just need small alterations in order to be worn. ** You’ll find that many or most of those “older” clothes are better quality than ones you could get today, and the colors are usually the ones you look good in, so will be excellent to use for a “new” wardrobe. ** Dust off the shoulders of those clothes that have been in the back of the closet. ** Make any minor alterations to the clothes you’ve selected that can become your “new” wardrobe. ** Do some refurbishing to those garments that need to look a little more modern – maybe some extra trim, maybe shorten the sleeves, maybe make the bell bottoms into straighter legs, etc. PRESTO! You have a whole new wardrobe without spending a fortune and have saved mega bucks in the process. ** Take the second pile of “never to return to the closet” clothes and get them ready for making other items. Remove all buttons, zippers, hooks and eyes and anything that can be reused – place them into a separate container for use in other projects. ** Depending on the fabrics that are in the rejected garments, you can make book covers, toddler clothing, children’s toys, placemats, fabric flowers for future projects, quilts, etc. 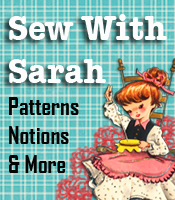 ** Check out the “How To Make Cash From Your Crafts” book, the “Nursery Room Projects” book, and various patterns from Patterns2Go and get tons of ideas on what you can do with all the fabric from those discarded clothes! Take the challenge – clean out your closets! And let us know about your “new” wardrobe and the crafty items you’ll be making from that pile of “discard” clothes.